Saudi Crown Prince Mohammed bin Salman says Riyadh “will pay nothing” to the United States for the kingdom’s “security,” in rebuttal to US President Donald Trump who recently said King Salman would not last in power “for two weeks” without US military support. “Actually we will pay nothing for our security. 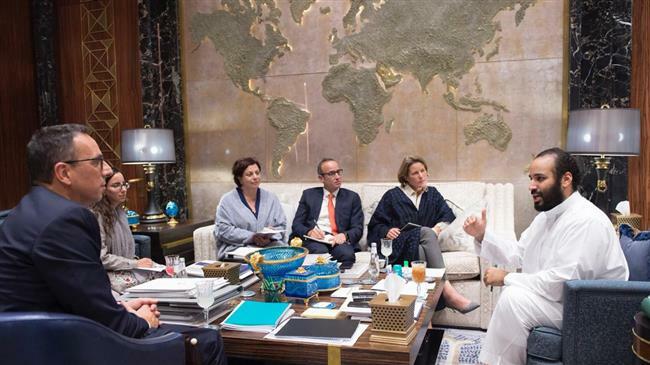 We believe that all the armaments we have from the United States of America are paid for, it’s not free armament,” the Saudi crown prince said in a Bloomberg interview conducted on Wednesday and published on Friday. The 33-year-old crown prince went on to say that Saudi Arabia had agreed to buy $110 billion worth of US weapons and signed investment deals worth billions more, some “$400 billion” in total, since Trump took office in early 2017, and described the deals as “a good achievement” for Trump. “We protect Saudi Arabia. Would you say they’re rich? And I love the King, King Salman. But I said ‘King — we’re protecting you — you might not be there for two weeks without us — you have to pay for your military,’”, Trump said. Last year, Trump signed the largest arms deal in history with the Arab country despite warnings that he could be accused of being complicit in the regime’s war crimes in Yemen.